Goddess Durga is worshipped in different forms . She is a form of " Shakti" .The evolution of Shri MahaSaraswati, Shri Mahalaxshmi & Shri Mahakali ( the main 3 forms of Shakti) took place from Shri Brahma , Shri Vishnu & Shri Mahesh respectively.Each of these 3 deities gave rise to 2 more forms.So , in all , these 9 forms together are known as " Navadurga ". Long back there lived a daemon king named " Mahishasur " ( also called as Daemon with a face of buffalo) who was very strong.He harrassed God Indra , fought with him and captured his throne.He was very proud of his strength.Indra went to the almighty gods - Brahma , Vishnu , & Mahesh , for help.These gods decided to teach a lesson to Mahishasur.They unitedly created a goddess "Shakti" and offered her their weapons to fight Mahishasur, who had become untolerable.Goddess Shakti fought with Mahishasur for full 9 days and ultimately killed him with her spear.Hence Durga is also known as " Mahishasur-Mardini ". The 9 days for which the goddess fought & Killed the evil daemon Mahishasur are celebrated as a major festival called " Navaratra".This festival is celebrated in a big way all over India in the month of " Aashwin" ( as per Hindu Calender)for the first 9 days . The Navaratri festival is celebrated by establishing Kumbh ( Ghata ), devotion, recitation, homage,fast & Vratas. "Nav" means new and nine. There fore it is very proper to celebrate the festival of Nav Durga in the beginning of new year. In both the Navratris in a year ,the devotees worships "Parashakti" with face dedication. The second Durga Shakti is Brahamcharini. Brahma that is who observes penance(tapa) and good conduct. Here "Brahma" means "Tapa". The idol of this Goddess is very gorgeous. There is rosary in her right hand and Kamandal in left hand. She is full with merriment. One story is famous about her. In previous birth she was Parvati Hemavati the daughter of Himvan. Once when she was busy in games with her friends. Naradaji came to her and predicted seeing her Palm-lines that, "You will get married with a naked-terrible 'Bhole baba' who was with you in the form of Sati, the daughter of Daksh in previous birth. But now you have to perform penance for him." There upon Parvati told her mother Menaka that she would marry none except Shambhu, otherwise she would remain unmarried. Saying this she went to observe penance . That is why her name is famous as tapacharini - Brahmacharini. From that time her name Uma became familiar. The name of third Shakti is Chandraghanta. There is a half-circular moon in her forehead. She is charmful and bright. She is Golden colour. She has three eyes and ten hands holding with ten types of swords - etc. weapons and arrows etc. missiles. She is seated on Lion and ready for going in war to fight. She is unprecedented image of bravery. The frightful sound of her bell terrifies all the villans, demons and danavas. Name of fourth Durga is Kushmanda. The Shakti creates egg. I.e. Universe by mere laughing .She resides in solar systems. She shines brightly in all the ten directions like Sun. She has eight hands. Seven types of weapons are shining in her seven hands. Rosary is in her right hand. She seems brilliant riding on Lion. She likes the offerings of "Kumhde." Therefore her name "Kushmanda" has become famous. Sixth Durga is Katyayani. The son of "Kat" as "Katya". Rishi Katyayan born in this "Katya" linege. Katyayan had observed penance with a desire to get paramba as his daughter. As a result she took birth as a daughter of Katyayan. Therefore her name is "Katyayani" . She has three eyes and eight hands. These are eight types of weapons missiles in her seven hands. Her vehicle is Lion. Seventh Durga is Kalratri. She is black like night. Durga hairs are unlocked. She has put on neckles shining like lightening. She has three eyes which are round like universe. Her eyes are bright. Thousands of flames of fire come out while respiring from nose. She rides on donkey. There is sharp sword in her right hand. Her lower hand is in blessing mood. The burning torch(mashal) is in her left hand and her lower left hand is in fearless style, by which she makes her devotees fearless. Being auspicious she is called "Shubhamkari." Ninth Durga us Siddhidatri. There are eight Siddhis , they are- Anima, Mahima, Garima, Laghima, Prapti, Prakamya, Iishitva & Vashitva. Maha Shakti gives all these Siddhies. It is said in "Devipuran" that the Supreme God Shiv got all these Siddhies by worshipping Maha Shakti. With her gratitude the half body of Shiv has became of Goddess and there fore his name "Ardhanarishvar" has became famous. The Goddess drives on Lion. She has four hands and looks pleased. This form of Durga is worshipped by all Gods, Rishis-Munis, Siddhas, Yogis, Sadhakas and devotees for attaining the best religious asset. The goddess Durga is called by various names such as Uma , Gauri , Parvati , Kali , Chandi , Bhairavi, Chamundi , Jagadamba , Aadimaaya , & Tripursundari. Rudrachandra , Prachanda , Chandogra , Chandnayika , Chanda , Chandavati , Chandarupa , Atichandika , Ugrachandika . Mahalaxshmi , Nanda , Shemkari , Shivduti , Mahamdra , Brahmari , Chandamangala , Revati & Harsiddhi. 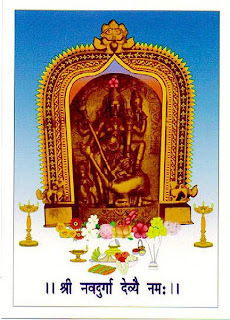 Rudranshdurga , Vandurga , Agnidurga , Ripumaridurga , NilKanthidurga , Shemkaridurga , Vindhyavasinidurga , Harsiddhidurga. Shri Navadurga at Madkaim ,Mardol, GOA. (Some more Temples to come up in the near future). In the naturally rich & beautiful Konkan Region of Maharashtra , lies the Sindhudurg district .Just few months back ,it has been declared as a Tourist District by the Government. It is situated on the south-west coast line of Maharashtra. & surrounded by Arabian Sea on the west.On the east are the ranges of Sahyadri. Towards the north is the Ratnagiri district , while Goa is towards its south. Sindhudurg has a huge coastal line of approx. 121 kms. There are 8 Tehsils (Talukas ) in this district namely ---Devgad ,Vaibhavwadi ,Kankavli ,Malwan , Kudal ,Vengurla, Dodamarg & Sawantwadi .Seven rivers flow in this district . Sindhudurg has lot many tourist attraction spots / temples as well as historical places .Among them are ---the famous Sindhudurg Sea-fort at Malwan built by the Great Chatrapati Shivaji Maharaj & other forts like Padamgad , Sarjekot , Rajkot . Nivti , Bharatgad and Bhagwantgad . At a distance of 7 kms from Malwan is "Tarkarli " beach .Dhamapur lake , near from Malwan has become an attraction now.Malwan is also famous for its Sea-shore ,Cashew nuts and the Jatra (Annual Festival) of BharadiDevi at Aangnewadi- Masure. In Devgad region ,major attraction spots are– the Seashore, Vijaydurg Sea fort , & Kunkeshwar temple ( Shiva , about 15 kms from Devgad ) . Sawantwadi is famous for its Wooden Toys , Narendra Hill , Moti lake & Amboli hill station (Hiranyakeshi & Nagartas waterfall). 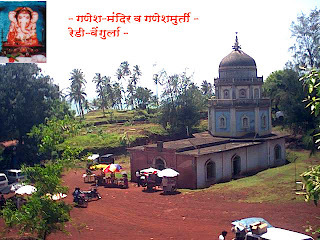 Great Saints like Shri Satam Maharaj of Danoli, Shri Raul Maharaj of Pinguli, Shri Tembeswami of Mangaon ,Shri Bhalchandra Maharaj of Kankavli belong to this Sindhudurg district. In & around Vengurla , there are lot many places to see like its clean & beautiful Sea-shore , Sagareshwar (Shiva)Temple , which is built in the Sands , Shri Mauli Devi Temple at Shiroda & Redi , Shri Navadurga Temple ,Shri Ganesh Temple (with only two hands) , Shri RamPurush Temple & Swayambhoo Shiva Temple at Redi . Also Shri Vetoba & Shri Sateri Devi Temple at Aaravali-Shiroda , the Shiroda Sea-shore ,and Shri Vetaleshwar Temple at Ajgaon are worth visiting among the others.Rameshwar (Shiva) Temple is the Gramdaivat of Vengurla.Also there is a beautiful temple of Sateri Devi in Vengurla. The town Redi (in ancient times known as "Redipattan" is situated at the southern most end of Vengurla .As per one of the books on Goa(Gomantak) written by Shri B. D. Satoskar ,it is mentioned that Redi was in ancient times capital of Gomantak (Goa ).The Devasthan ( Temple) of goddess Shri Navadurga is situated in the Kanyale hamlet (Wadi) of Redi. This region Vengurla – Redi is simply enchanting. Nature seems to have smiled on this spot. Coconuts , betalnut , plaintain ,Mango & Cashew trees are cultivated in plenty here. The Arabian Sea is very near .Also Goa border (Terekhol) is at a distance of 4 km from this place. At Terekhol lies the historic fort which is converted now into a tourist spot.View from the fort of the Arabian Sea is very beautiful. Climate here is very healthy and one can enjoy the cool breeze. Usha Ispat Pig Iron plant is one of the major Companies here. Redi has a historical significance as the famous fort "Yashwantgad " resides here. Redi is also one of the most important sea port .It is also famous for mining activities –especially for iron ore. Among the prominent temples in this region are the Mauli Temple , the Ganesh Temple , the Swayambhoo Shiva Temple ,the RamPurush Temple & the Navadurga Temple. This Deity & the temple is in Kanyale –Redi for last more than 450 years. Though the name is Navadurga , she is in Ashta Bhuja ( having 8 arms ) Mahishasur Mardini form. In her hands are – a conch shell (Shankh) , a wheel (chakra ) , a club (Gada ) , a lotus (padma ) , a spear (trishul) and a lance (bhala).By one hand she holds head of Mahisha , the daemon , and underneath her lies the buffalo .Hence she resembles Mahishasur Mardini. The two big festivals, celebrated annually (called Jatras )of this Deity are during Navaratris in the month of Ashwin & on the Shuddha Navami (9th Day ) of month Magha as per the hindu calendar. During these festivals , the temple and the surrouding area is decorated and lighted with colourful lamps. Also special drama show ( called Dashavatars ) is held during whole night . It is believed that this deity is very powerful and answers to the calls of her devotees. While taking her "Kaul " (her orders) , 52 leaves of "Karamali " plant are applied. Near the Temple are two accomodations (Niwas ) for her devotees , the Dharmashala , & the Pakshala (Kitchen) . Within this temple , there are idols of other deities also like Kasi Kalyani Brahman , Jain Brahman , Bhavnath , & Deva Bharacha Purvas. The Palakhi Ceremony of the Goddess is celebrated four times in a year. Various daily and occasional ceremonies , programmes etc. are held at this temple like Abhishekha & Naivedya , Kumkumarchana , Tulabhar (weighing a person with coconut , sugar , etc ) , Nandadeep (lighting ) , prasadam ,meals for brahmins , purana , palakhi ceremony & Mahapooja.The RamPurush Accomodation (Niwas) is also available nearby. This goddess originally belonged to the town "Gavasi " (or Gawasi )of Tiswadi District , near Madkai village in Goa. It is really very interesting to know how this goddess reached Kanyale –Redi ( in Maharashtra) from Goa.The original idol was as old as of 10th Century. It is not known who had installed this idol in Gavasi . It is told that About 400 years back , during the 16th Century , Portuguese ruled Goa and destroyed many Hindu Temples & carried out many conversions forcibly .The then devotees of this goddess , who got afraid of these ruthless destruction & conversions to christianity decided to shift this deity from Gavasi. The idol was carried by a Servant on his head along with the other devotees. The devotees had planned to re-install it at Vengurla (in Maharashtra ) ,which was a major port and business centre. On the way , while travelling , they took a halt at Redi for taking some rest. Naturally the idol was kept on the ground. After their rest period was over , they decided to move further towards Vengurla , and hence tried to lift the idol from ground. But to their astonishment , the idol just could not move even an inch from its place , as if magnetised. They tried a lot to move it but just failed. The devotees who strongly believed in "Prasad" , asked for Kaul (order ) from the then Shri Mauli Devi , of Redi. They were curious to know why the goddess was non-coperative in moving further (towards Vengurla ).The Mauli goddess gave an explanation that Devi NavaDurga wished to stay at Kanyale-Redi only and that she should be installed there itself. Obeying the goddess’s orders , the devotees purchased land there and built her temple there. From then till to date , the goddess is staying in Kanyale peacefully and the devotees have been worshipping her there. It is not known exactly why this goddess is called NavaDurga (having 9 names) but some guess that it could be that there existed perhaps 9 such temples in Gavasi , and hence the name. Many devotees (Mahajans , as they are called – who have this goddess as their family deity )got settled in Ubhadanda ( a place in Vengurla ) while others got shifted to Pune , Mumbai , Goa , Karwar , Cochin , Bangalore & Mangalore , while some settled in few other towns. In 1971 , one of the Pujari(Priest) of the goddess happened to see a crack in her idol. It is a belief that whenever any idol gets some defect , it has to be replaced with religious ceremony. Accordingly as per the order taken from Shri Mauli Devi , a new identical idol was sculpted (present one ) and installed with full religious ceremony on 12-02-1975. This , so called "Pratishthapana" Ceremony went on from 12-02-75 to 16-02-75 and it was a grand celebration. The old idol was immersed in the Sea there with full religious procedure. On the Mumbai –Goa Road , one has to get down at Vengurla or Sawantwadi .From there no. of State Transport buses available to go to Redi or direct to Kanyale. , via Aronda and Shiroda.This journey is of about 1 to 1 ½ Hours .From Mauli Temple of Redi , Shri NavaDurga Devasthan is at about 1.5 Km distance .Autos are available.One can walk from Redi towards Kanyale in 20-25 minutes. From Goa side , you need to arrive at Terekhol creek first via Siolim & Keri. Ferry Boats are available to cross the creek and to arrive at Terekhol fort side. From here , Kanyale is at a distance of about 2 Kms by shortest walking route .By Vehicle Road , it is approx. 10 kms from Terekhol. Another route from Goa is to come from Pedne via bus which crosses a bridge and you have to pass Ajgaon to come towards Shiroda. While this is the only NavaDurga in Maharashtra (originally from Goa) , there are some other NavaDurga’s still in Goa, at places like Madkai , Kundai , Pale , Bori and Paingein . There is lot of similarity in the idols of Kundai & that of Kanyale.